1. Preheat the oven to 200°C, gas mark 6, and place 9 muffin cases in a muffin tin. 2. Prepare the muffin mix, oil, egg and milk according to the pack instructions, and divide between the 9 cases. Bake for 15 minutes until a skewer, when inserted in a muffin, comes out clean. Allow to cool. 3. Whisk the cream until it holds its shape and place in a piping bag with a 1cm nozzle. 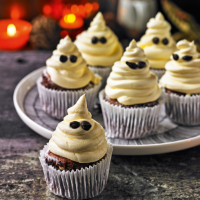 Pipe the cream onto the cakes to create ghost shapes. Use the chocolate chips for the eyes. This recipe was first published in Tue Oct 27 15:38:00 GMT 2015.